Staying in a treehouse can be a luxurious, relaxing experience. For those interested in a unique getaway that connects you with nature, there are treehouse resorts, hotels, and retreats spread all over the country. These treehouses range from basic ones that let you reminisce about your childhood while connecting with nature to luxurious treehouses that are on par with five-star resorts in terms of the amenities they provide. This Connecticut retreat, sitting 35 feet off the forest floor, is one of several accommodations offered at Winvian Farm. The bedroom on the first floor has a king bed, a steam shower, a Jacuzzi, and a gas fireplace. Going up to the second floor shows you the lounge with its full bar, gas fireplace, and views of the treetops and surrounding forest. Other amenities include a porch, rainfall steam shower, BOSE stereo sound, free wireless internet, a flat-screen TV, Harney & Sons Fine Tea, espresso, and Nespresso coffee. Winvian Farm has 113 acres of land in Connecticut’s Litchfield Hills. Guests have access to bikes to explore the area or they can just walk along the various winding paths or stroll through the garden. The luxury spa is perfect for relaxation, as is the 40-foot swimming pool in a green meadow and the yoga studio. 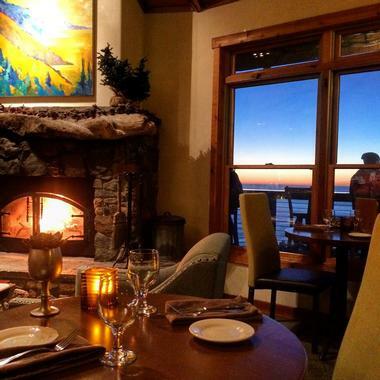 Enjoy a meal at the Farm-to-Table Restaurant with its five stars. 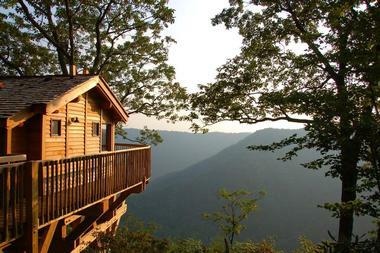 Primland offers guests a range of accommodations to choose from, including three treehouses. 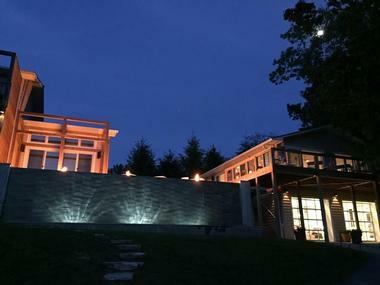 Each has its own vast private deck with views of the North Carolina Piedmont and Kibler Valley. The treehouses consist of a large studio design with a king bed and a bathroom complete with a soaking tub. The beds are fitted with 400-thread-count Frette sheets plus lush duvets and complemented by elegantly stitched pillow shams and quilts from Vivanais. The rooms also include phones, flat panel TVs, Keurig coffee makers, an in-room beverage center, robes and slippers from Abyss & Habidecor, a nightly turn-down service, and daily housekeeping. Guests of the treehouses get four-wheel drive vehicles to make it easy to access the lodge. This makes it easy to take advantage of other amenities and attractions on site, including the observatory, the spa, the Highland Golf Course, the vast expanse of land, and dining options including refined dining at elements, a more relaxed meal and drink at the 19th Pub, and the historic Stables Saloon. Just some of the available activities include nature walks, shooting sports, sporting clays, horseback riding, stand-up paddleboarding, stargazing, geocaching, fly fishing, and disc golf. When you stay at one of the treehouses from the Cypress Valley Canopy Tours, you get to go on a zip line tour of the canopy as well, provided it is the right season. There is a total of four treehouses as a well as a ranch house for those who want to stay on the ground while feeling like they are in a treehouse. Most treehouses sleep two while one can fit six and the ranch house can fit 14. The amenities vary slightly between rooms with two treehouses having their own private bathrooms and the other two sharing one. All treehouses have lighting and electricity and the amenities vary. These can include a kitchenette, heated natural rock tub, hammock, small table, dining room, multiple bedrooms, an indoor waterfall, a porch or deck, and a lounge area with wingback chairs and floor pillows. Some accommodations also have small fans or air conditioning units. All guests are welcome to access the seasonal pool and the lake along with the grounds. The treehouses are just one of many types of accommodations at the Post Ranch Inn. Each of these is a free-standing structure constructed on stilts that place them 9 feet off the ground, with a stairway leading to the entrance. Every room is triangular and has a skylight, fireplace, desk, window seat, and king bed. Other amenities include an iPod docking station, stereo and digital music system, private deck with mountain views, in-room dining, tea and coffee, nightly turn-down service, irons and ironing boards, walking sticks, organic bath products, terry cloth robes, slippers, hair dryers, and in-room safes. The treehouses have wireless internet and guests are welcome to access the inn’s other amenities, including the swimming and infinity pools and the fitness center. They can attend complimentary activities like garden tours, guided nature hikes, yoga, and stargazing. Other amenities include a spa and access via a helicopter. There are even shuttles and Lexus vehicles available for guests. The reservation includes a daily gourmet breakfast in the form of a buffet as well as a mini-bar with non-alcoholic beverages and snacks. Guests can also dine at the inn’s restaurant Sierra Mar. To get to the private treehouses, guests cross a footbridge that is connected to the 80-foot cypress trees complete with wild mustang grapevines that have been around for decades. The treehouses have modern construction and engineering to deliver conveniences like bathrooms, kitchens, satellite televisions, wireless internet, and air conditioning. Most treehouses are set up with an open area for the kitchen, dining, and living rooms and a sleeping loft above plus a master suite featuring a full bathroom. They all have attached decks, most of which are private. Since the treehouses are connected to the hardwood trees sitting by the seasonal creek, guests get excellent views from the decks and can even access the river directly from the property. The property also features a river park area with more than an acre with water frontage. Guests can sit in their chairs, go swimming, or go tubing. The Aviary is one of multiple rooms guests can choose at Wheatleigh. As the name implies, it is in what used to be an aviary, meaning the space is very open with natural light and excellent views. The living room downstairs has windows on every side along with a BeoVision 9-50 Entertainment System. The sleeping room upstairs feels as if it is floating above the trees and is reached by a circular staircase enclosed in glass. The bathroom has a shower area and soaking tub as well as plenty of glass and limestone. The Dining Room has earned national recognition and features seasonal menus created by Chef Jeffrey Thompson. Or guests can enjoy a simpler yet still elegant meal in the Library. Although not on site, Wheatleigh partners with the Stockbridge Golf Club, which is just 5 miles away. Guests can also access numerous other local golf courses. The Laurel Treehouse at Fire Mountain Inn is completely private with its own parking area and an elevated boardwalk that takes you through the woods. The interior of the treehouse has a European king bed, a floor lamp, a chaise lounge sitting area, a shower/bath, two spacious closets, and a large window with views of the sunset. The shower includes herbal soaps and shampoos. Other amenities include three-speed fans in both of the rooms, original art, hardwood floors, insulated glass windows, a wine opener, wine glasses, ice bucket, maid service, iron, hair dryer, night lights, extra blankets and pillows, linens and towels, and loft drapes. The exterior of the treehouse has a spacious wraparound deck giving guests views in every direction. There is also a hammock along with folding teak furnishings, including a side table and two canvas teak chairs. The other side of the deck has chairs and bistro tables. Depending on the season, there are also large ceramic and terracotta pots filled with ferns. Guests are also welcome to take advantage of the other amenities at Fire Mountain, including the Fire + Water Restaurant, viewing decks, the Sky Bar & Lounge, The Kitchen Café, and the air spa with yoga and massages. Bolt Farm Treehouse offers beautiful unique accommodations in Walhalla, located on 40 acres of farmland within upstate South Carolina. 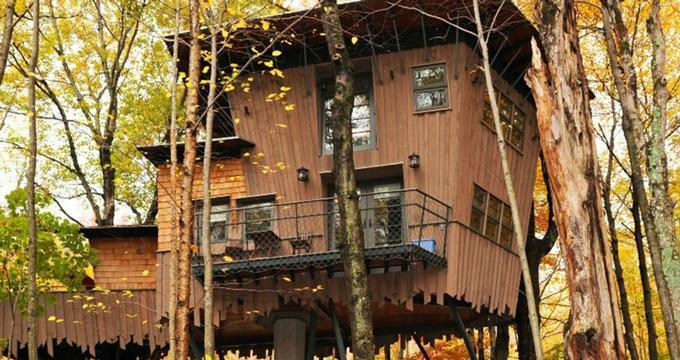 The AirBnB-operated concept resort features two private luxury treehouses constructed by Seth and Larry Bolt. The eco-friendly treehouses blend modern amenities with natural beauty, offering en suite bathrooms, full electricity, and heating and air conditioning units. A secluded outdoor shower offers full privacy and hot water year-round. Visitors should note that children under the age of 15 are not allowed in treehouses, as farm facilities are decorated with valuable antiques. Jackson Hole Hideaway is a bed and breakfast as well as a lodge with spacious suites and rooms. In total, there are two king rooms, two queen rooms, and a suite. They can feature amenities like private bathrooms, private decks with or without swings, vaulted ceilings, and window seats. The suite has two private rooms with a king bed and the choice of either a king or two twin XL beds, a private deck, a TV, large foyer, and private entrance. This lodge has a fire pit along with extensive deck space where you can relax and watch nature or read a book. Guests get to enjoy a cold and hot breakfast every morning. There are always a range of options with the ability to accommodate special diets with advance notice. Guests can choose from cereal, yogurt, granola, fruit, homemade breads, and the sweet and hot entrees. The inn always uses local ingredients, including meats, when possible. Every afternoon during check-in, there are refreshing drinks and light appetizers. Just like the name implies, Missouri Treehouse Cabins provides a range of cabins set up in treehouses for guests to choose from. There are 13 treehouses, a chalet, two lodges, and four lodge suites. Every single cabin has a charcoal BBQ, but guests need to bring their own lighter fluid and charcoal. The cabins also have full kitchens with eating implements, towels, extra blankets, bedding, and toilet paper. The treehouse cabins can also have native stone fireplaces, covered decks, room for up to eight people, multiple bedrooms, fireplaces, two whirlpool tubs, two bathrooms, and air conditioning. Certain treehouses are designed specifically for romantic getaways. Guests can choose to have a therapeutic massage on their treehouse’s private deck. They also have a spacious lodge for hosting events and 350 acres of land perfect for secluded privacy. 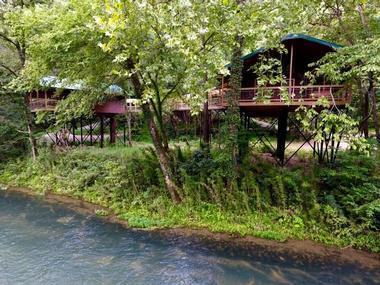 Guests can wade for fish in the North Fork River’s Blue Ribbon Area right from the property. They also offer fly fishing trips, kayaking, and canoeing Missouri float trips. This four-star Treesort combines a resort-like experience with the chance to stay in the trees. There are two spacious shared bathrooms in the communal building along with an extra bathroom in the main lodge. There are five treehouses to choose from, including those with room for up to seven people. They include features like kitchenettes, full bathrooms, lofts, multiple beds, rollaway mats with sleeping bags, sitting areas, and/or small toilets with sinks. The Treesort has multiple additional treehouses for daytime use only, although they should be available for overnight use in the near future. Guests have access to the central facility for laundry, bathrooms, and a guest kitchen. There is a fire pit that is perfect for roasting s’mores and more and the guest kitchen has a large fridge, pots, pans, dishes, and utensils plus a range top and microwaves. There are also charcoal and gas grills. The property includes 36 private acres of land that features woods and pasture and is right next to wilderness growth. The owners have a breeding ranch for Morgan horses, a riding horse stable, four dogs, a cat, and two rocking horses. Your stay includes a full breakfast that can include things like fresh muffins, quiche, eggs, and more. Berlin Woods Tree Houses are part of the Amish Country Lodging by Berlin, Ohio, and give you the chance to get away from it all. There are six different treehouses to choose from, each of which has a full living room complete with a fireplace and a full kitchen with a stove, microwave, fridge, sink, toaster, and coffee maker. Other treehouse amenities include satellite TV, a DVD player, free internet access, a two-person stone Jacuzzi, a front porch featuring rocking chairs, and furniture and beds crafted by the Amish. Three of the treehouses have king beds, while three have both two king beds and two twin beds. 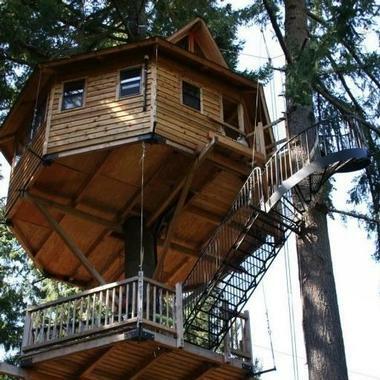 As such, treehouses can fit anywhere from two to six people. The treehouses were all custom-built during 2016 and are perfect for any type of getaway. They are just a mile away from Berlin, making it easy to access the local attractions, shops, and restaurants during the day and enjoy nature at night. The Redwood Tree House is a single vacation home surrounded by redwoods in a grove along the Russian River. The beds feature Pima cotton sheets with a 500 thread count, soft pillows, Pendelton wool blankets, and cozy comforters. There is a “hobbit” living room with a cable television, armchairs, and a soft sofa. The dining area has space for 8 to 10 people to enjoy a home-cooked meal made in the fully equipped kitchen. The Main House has two bedrooms with seating for up to four adults plus children as well as a private and secluded garden along the riverfront with a six-person hot tub surrounded by a fern grotto. The Nest Guest Cottage with its own small outdoor deck, shower bathroom, and queen bed can be added to the Main House, but not rented separately. 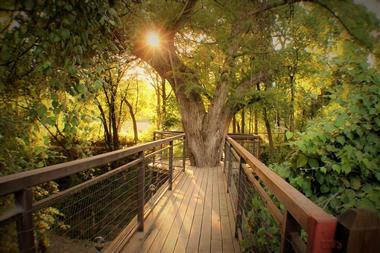 The exterior of the treehouse has a furnished deck perfect for relaxing and enjoying nature. Thanks to its location, guests can easily leave their room and talk a walk through the woods. Sonoma’s wine country is also easily accessible from the Redwood Tree House. It is only 3 miles from historic Healdsburg Plaza. 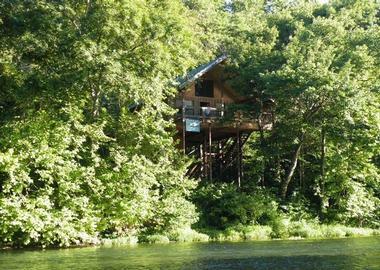 The River of Life Farm has a range of vacation rentals, including a lodge, romantic cabins, and a number of treehouse cabins. The treehouses are open all year round and offer modern amenities in a unique setting. Amenities vary from treehouse to treehouse, but can include fully equipped kitchens, bedrooms and lofts, huge decks, stained glass windows, a whirlpool for two people, a porch swing, and accommodations for two to eight. Those who prefer being on the ground can fit up to ten people in the two-story bungalow chalet or up to four people in one of the lodge suites with their kitchenettes, air conditioning, and full bath. The property itself covers 350 acres of land, including many secluded areas that offer guests plenty of privacy. There is instant fishing access to the famous “miracle mile” portion of the North Fork River’s Wild Trout Management Area. Other activities on site include hiking, horse trail riding, bird watching, canoeing, and kayaking. Each of the Edisto River Treehouses is tucked away in the woods out of sight of the other buildings for complete privacy. The treehouses are in trees by the edge or the river and can be privately accessed via canoe. They are made from natural materials, most of which were harvested locally. The sleeping area is screened in for bug protection and is well ventilated. Small treehouses sleep two to four people while medium treehouses sleep three to six and large ones sleep five to eight. The treehouses have futons, pillows, cooking utensils, and a propane stovetop along with an outdoor dining deck and grill. Lighting comes via oil candles and torches and all treehouses have river views plus plenty of natural shade from the trees. These treehouses are off the grid without running water or electricity and have their own outhouses. 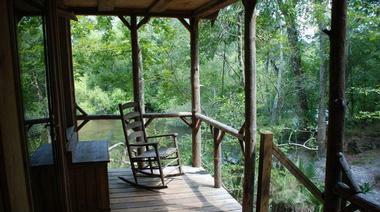 Guests of the treehouses also have access to the complete Edisto River Refuge area, which spans 100 acres. This land includes plenty of privacy, a mile and a half of land along the riverfront, miles of walking trails in the shade, and plenty of wildlife. Staying in the treehouses is designed to accompany a canoe trip as they are the halfway point along a 23-mile trip canoeing up the undeveloped river. 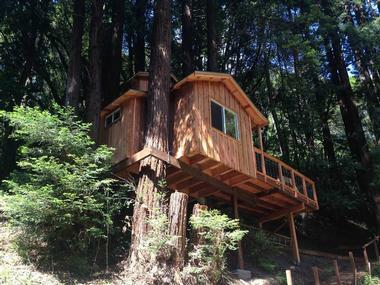 The Star Redwood Treehouse is a cozy getaway perfect for two people. 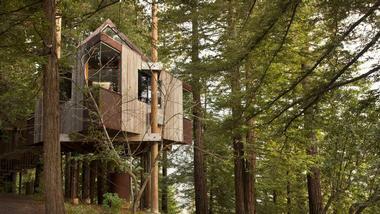 This treehouse sits among towering redwoods and the interior is made from new pine with oak flooring. The bathroom has modern tiles, a shower, and a sink. The queen bed sits in the loft bedroom and is also new. The entire space covers 300 square feet and there is wireless internet as well. There is a kitchen equipped with a fridge, microwave, and coffee maker and heating is available. Guests can also take advantage of the satellite TV and stereo system. Those staying at the treehouse can enjoy the redwood entry deck or sit outside and take advantage of views of the wooded canyon. Guests will only be 5 minutes away on foot from the Mystery Spot and a short drive to the beaches in Santa Cruz or numerous local golf courses, including a Frisbee golf course. 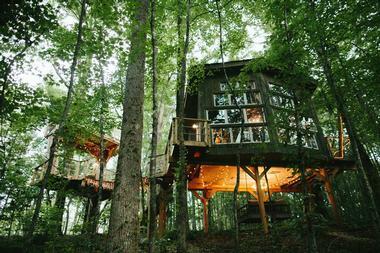 A unique choice for a treehouse getaway is Buckhead Treehouse in Atlanta. 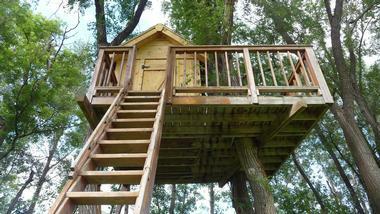 This treehouse is actually in the woods fairly close to I-75, making it easy to access. It consists of three distinct areas. The bedroom has a pillow-top double bed on wheels so you can bring it outside to the outdoor platform. This bedroom also has an antique birdcage and a small desk. There is also a balcony that looks over the lush woods, complete with a dart board and hammock. You get views of the “Old Man,” a 150-year-old tree. The third area is a living room featuring 80-year-old windows filled with butterflies, antique seating with room for six, and a 12-candle chandelier. All three areas are connected via sturdy and picturesque rope bridges. The treehouse has wireless internet and upon arrival you are offered snacks and wine to help you relax. 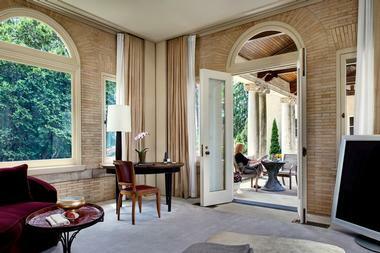 The bathroom is a 30-second walk away in the lower level of the hosts’ private home and guests have exclusive access. The Grand Treehouse Resort proudly offers guests more amenities than any other similar treehouse lodging, creating an experience to remember. There are two treehouses plus a gate house for guests to stay in. All have wet bars with medium-sized fridges, utensils, dishes, microwaves, toasters, and coffeemakers. They also have 32-inch flat-screen TVs with DVD players, stereo systems, Jacuzzis for two, heated towel racks, stain glass windows, Egyptian cotton towels, luxury bed linens, air conditioning and heating, hair dryers, glass walk-in showers, seasonal gas fireplaces, chandeliers, and wireless internet. Some also have an outdoor shower. The resort itself is surrounded by wild forest and is around 5 minutes from historic Eureka Springs. There are trolleys that can take you from the resort to Eureka Springs with a stop just across the street from the resort. Those looking to make the most of their stay can opt for one of the packages, such as those for weddings, anniversaries, and birthdays. Guests get the chance to stay in their own private treehouse that is complete with two beds and a bathroom. The treehouse sits between four maple trees 30 feet above the gorgeous ferns. Guests access it via a ramp that is 70 feet away from the main house. The treehouse has a small fridge, heating, and electricity. 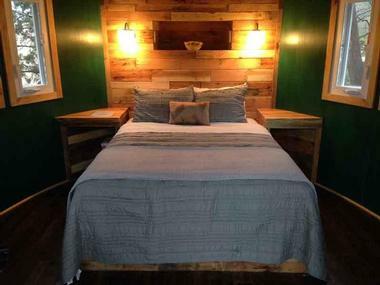 There is a single bed on the main floor with a queen-sized futon complete with a down comforter up in the loft, which is reached by climbing a ladder. Guests can sit in the reading rocker or on the spacious deck. The host provides complimentary toiletries and includes linens. The exterior of the treehouse has a hot tub that is available all year round and an outdoor shower hat tis available in the summer. The treehouse itself has the basic amenities while the main house holds the private bathroom complete with a shower. Small pets are welcome with advance notice and guests are treated to a continental breakfast in the sun-filled dining room. The Human Nest at Treebones Resort can most closely be compared to a treehouse, but seeing it will give you a better idea. It looks like a giant nest with artful arches and a base that is hanging from the trees. The Human Nests are made from woven wood and created by local artist Jayson Fann. Guests should bring sleeping bags and other camping gear. You should also bring along a tent if rain is in the forecast as the Human Nest isn’t waterproof. Each Human Nest has room for two people and is accessible via a wooden ladder. Inside, you will find a full-sized futon mattress. Treebone Resort is a walk-in camp site that includes access to water and a picnic table. Because the nests are made from wood, there are no campfires or cook fires allowed. Instead, plan on eating at the lodge restaurant or bring a tabletop camp stove. The resort also offers other types of accommodations along with activities like outdoor yoga, biking or kayaking tours, and massages. There is lots of hiking nearby. 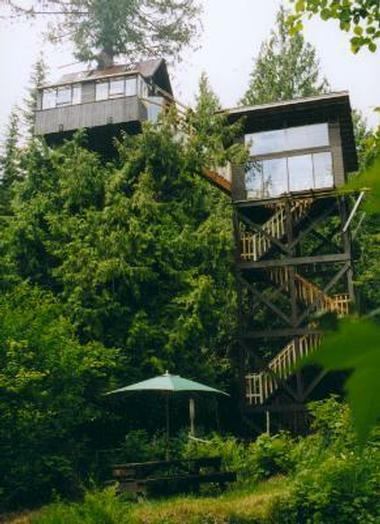 Bill Compher built the Cedar Creek Tree House between 1981 and 1982 and it stands 50 feet high, giving guests amazing views of the surrounding nature. The five-story staircase was built from 1993 to 1997 and makes access to the treehouse easy. Guests sleep 50 to 80 feet above the ground in a loft close to the trees and wake up with birds nearby. The treehouse also includes a kitchen that is very functional and convenient to use, although there isn’t a fridge or outlets and no running water; instead you get several jugs of water. The building has three levels, including a sitting area, the kitchen, a loft with room for four people, and a single bed. The treehouse provides amazing views of Mt. Rainier as well as the sky thanks to skylights in the ceiling. Guests also get access to a sitting area by a stream, a fire pit, and a charcoal grill. The Original Treehouse Cottages offer guests the chance to stay in treehouses that were hand built and designed by the owners in 1990. 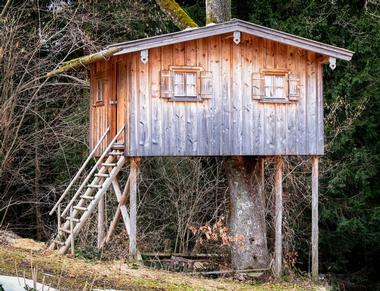 The first treehouses were built on top of wooden poles that were 22 to 26 feet off the ground and surrounded by trees. The in-town location has three treehouses and a two-story ground-level cottage, or there is a Hidden Forest location with four treehouses. The treehouses are luxurious with heart-shaped Jacuzzis with glass around them to create views of the forest. There are fireplaces for use in season, fine antiques, Tiffany chandeliers, wraparound decks, full kitchenettes stocked with homemade pumpkin bread and other snacks, huge picture windows, vaulted ceilings, and luxury linens. Other treehouse amenities can include air conditioning and heating, stained glass windows, dining areas, HDTVs, DVD players, CD players, wireless internet, gas grills, patio sets, and handmade tiles. The Hidden Forest location sits in the middle of a 33-acre forest filled with tall pines, making it perfect for complete seclusion. The in-town location has a terraced flower garden, cascading waterfall, koi pond, and gift shop. Treehouse Point is easily accessible and surrounded by gorgeous forest by the Raging River. In addition to staying the night, there are also guided tours of the treehouse available or you can plan a wedding or other event here. The treehouses have hand-hewn beds and amazing forest views. There is also wireless internet. The treehouses share a set of private bathrooms that are on the ground level and equipped with toiletries, sinks, toilets, and showers. Some treehouses also have toilets for emergency use. 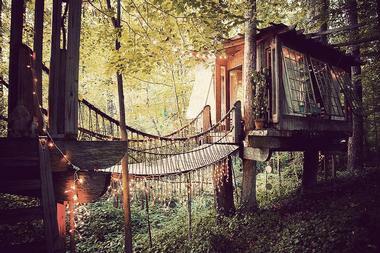 Most treehouses sleep two people but one can sleep up to four people. Guests are welcome to explore the grounds, play a game in the library, take advantage of the fire pits, or just relax by a fire in the lodge. In the morning, guests can enjoy a continental breakfast that has been homemade in the lodge. 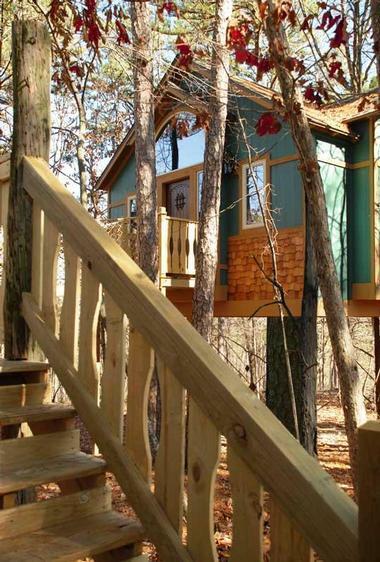 The Treetop Hideaway Cabin is actually one of several treehouse cabins available at Treehouse Cabins. This cabin has a private deck overlooking the North Fork, letting guests be lulled by the sounds of the flowing river. It was designed for romance thanks to its seclusion and hiding spot along the tree tops by the stream. The structure was handcrafted to include cedar cabinets, a native stone fireplace, and stained glass windows, making it the perfect honeymoon cabin. Guests will sleep in a custom-made cedar log canopy queen bed that is truly one of a kind. Right from the bed, you even can stargaze thanks to the skylight. 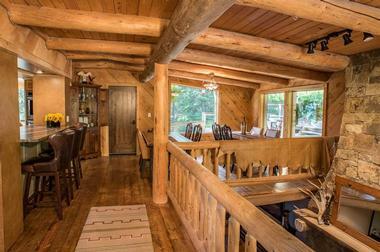 Throughout the cabin, you will find native red cedar woodwork. It also has a full kitchen with a microwave oven and the unit is air conditioned so you can get close without overheating. The deck has a table, chairs, and a swing with trees growing around it. For additional romance, there is a whirlpool tub for two people. The charcoal barbeque offers an alternative to cooking in the kitchen. 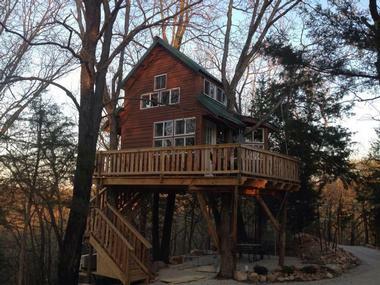 The Hermann Missouri Tree Houses include two different treehouses as well as a cabin that can sleep two to four people and is handicap accessible. The treehouses are known as “Sunrise” and “Sunset” and have full indoor plumbing, a heating and air conditioning unit, and wireless internet. There is also a Keurig coffee maker with multiple coffee choices, a small fridge, a microwave, and bottled water. The rooms are stocked with towels and linens, but guests should bring their own toiletries. Sunrise has a queen bed while Sunset has a full bed; both have chaise benches as well. The exteriors of the treehouses have large decks with amazing views and there are seating areas in both treehouses. Guests are also treated to a hot breakfast every morning that includes a smoothie as well as a savory and sweet dish. Enjoy the breakfast in the Cottage, which is the main building. As an alternative, you can request to have a continental breakfast in your fridge with items like fruit, cottage cheese, and muffins.